When I first began to be serious about gluten-free living (actually living as opposed to avoiding the issue) I began to copy likely looking recipes off the web. When I began to blog about the gluten-free journey for Rita and me then the issue arose of giving credit to other bloggers who offer their insights and share their recipes. So I have recipes like this one that was inspired by Raspberry Double-Coconut Muffins from I-know-not-where. Yes, I searched many combinations of variables with no hits. Perhaps this generous person no longer blogs or has taken up other topics. But today Rita, her husband David, and I spent several fun hours trying the basic batter in several different forms. The batter was specified for muffins. But we were craving waffles as well as wanting to test the waffle iron. It was a a re-sale bargain and in need of a good gluten-free waffle batter. So here we went again. After the basic batter was mixed Rita turned half of it into muffins while I presided over the waffle iron and David gallantly assisted us both with a thorough evaluation of all results. The three of us loved this recipe equally as muffin or waffle. We tested pancakes by adding more liquid to the batter but the flavor balance was off. Another day, another experiment will be required for pancakes. Preheat your oven to 400*F if you plan to have muffins. In your batter bowl whisk together all of the dry ingredients. In a separate bowl beat together all of the wet ingredients. Then dump the wet ingredients into the dry ingredients and whisk all together. As in all such batters it will still be a bit lumpy but especially so with the coconut flakes. For waffles: heat the appliance according to instructions. Oil it well with vegetable oil (we used coconut oil). When the appliance light signals that it is ready, spoon in the recommended amount of batter. Close the top and wait until it signals that the waffle is done. Then pull the waffle out and proceed to make the next one until the batter is all used up. For muffins: spoon a good tablespoon of batter into each of 12 muffins cups or tins. 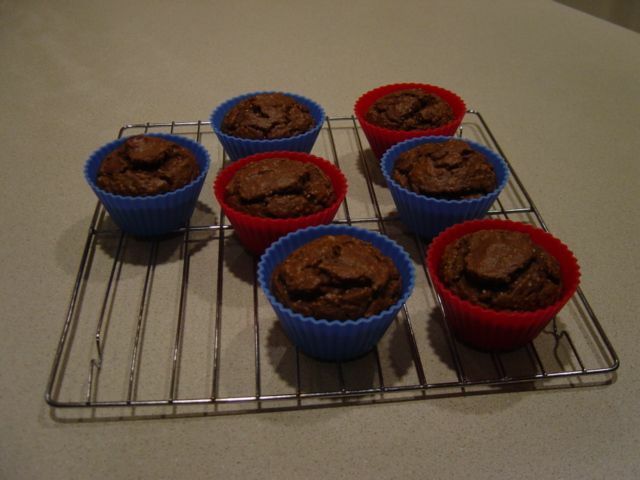 We used the handy little silicon muffin cups that pop out muffins and wash up easily. Place about 1 teaspoon of jam in the middle of each cup. We tested fig preserves, seedless raspberry jam, and orange marmalade. Spoon in the remaining batter divided between the muffins to cover the jam. Bake for about 25 minutes depending on your oven. They will be very firm to the touch when they are done. Rita recently sent me the proportions for a juice drink that she has been using on her ‘love your liver’ diet. It is simple, tart, and tangy and each ingredient is something that I already have on hand but had never used in this combination. Baking efforts over the summer left me wondering if I would ever have a successful bread or muffin incorporating bananas. I was nearly resigned to using dry banana muffins mashed up with fresh fruit for a breakfast pseudo-cereal. Then along came Sweet Freedom. These recipes are going over to the gluten-free side so easily that I have enlisted family and friends to enjoy them with me – and they don’t seem to mind! The Oatbran Banana Muffins with almond butter are breakfast heaven. The only adjustment that I made to Ricki’s original recipe is to replace the 1 3/4 cups of spelt flour with a like amount of flour blend that I favor in most sweet recipes. The past few weeks have been an endless circle of baking and modifying a recipe after Rita challenged me to enter a healthy Christmas cookie recipe contest. My initial reaction was ‘isn’t that an oxymoron’? Nevertheless I started brainstorming and baking. One experiment was enough to convince me not to desecrate chocolate in this manner. So then the burden fell upon the much-loved gingerbread cookie. After quite a few versions and gracious friends nibbling and ranking them the recipe was written and submitted. It met Rita’s greatest hopes in that this delicious cookie is built from mostly nutrient dense gluten free flours and that it is also egg free and dairy free. She has friends that will benefit greatly from this combination. She and I also came up with an appropriate frosting/filling to make the basic recipe more festive. Even though the cookies are good I am so burned out on gingerbread right now. There are leftover cookies in the freezer so that in a few months I can think about a crumb crust for pumpkin cheesecake. And I will write all about it then. Quick bread recipes are versatile in that you may bake them as a loaf or divide into muffin cups for individual portions. This cinnamon bread recipe is my most happy accomplishment right now that I have been anxiously waiting to post. It is adapted from Erin McKenna’s Cinnamon Toasties recipe that she demonstrated on the Martha Stewart show and can be viewed on Martha’s website. I use tapioca instead of arrowroot and add ground flax seed as well as increase the xanthan. It can be made diabetic friendly by using a sugar substitute designed for baking – my choice is Lakanto but there are others available that are less expensive and locally available. The result is a firm loaf that slices beautifully. Small peanut butter sandwiches made with thin slices of this bread are a satisfying, healthy treat for breakfast, lunch, or snack! Preheat oven to 325*F. Spray or oil a large loaf pan. In a large bowl, sift together all of the dry ingredients. Sift together several times so that they are completely combined. The various dry ingredients have different nutrients and baking properties and they all need to be well blended before the liquid is added. In a smaller bowl, whisk together oil, applesauce, and orange extract. Then add the hot water to the mixture. Add the oil/applesauce mixture to the flour mixture and stir until well combined. Scrape the batter into the loaf pan and even it out across the pan and into the corners. Transfer the pan to the oven and bake about 30 minutes. Turn off the heat and allow the loaf to remain in the oven for at least another 30 minutes. It will be toasty brown on the outside. Test with a cake tester just to be sure it is completely done. Let it cool completely on a wire rack or in the oven before unmolding. Then wrap it in a tea towel so that it does not dry out. When it is completely cold you may wrap it for storage. This is an excellent keeper but after a day store it in the refrigerator. You can also freeze it. Note: This loaf sinks slightly in the middle upon cooling but is definitely cooked all the way through. There was an interesting looking recipe for scones on the back of the sorghum flour bag. Those scones sounded good. After measuring out all of the dry ingredients my thinking took a sudden left turn and I suddenly decided spices were in order and butter and yogurt were out. The first batch only had the cinnamon spice but I decided upon tasting the result that this recipe needed to go a little farther and morph into gingerbread by adding ginger and cloves. Unlike some other recipes that are best right out of the oven these were much better the next day. The moisture becomes evenly distributed and the spices mellow. Prepare the muffin pan and set aside. Sift the dry ingredients together and set aside. Whisk the coconut milk, applesauce, and vanilla together. Pour over the dry ingredients and mix thoroughly. Stir in the raisins. 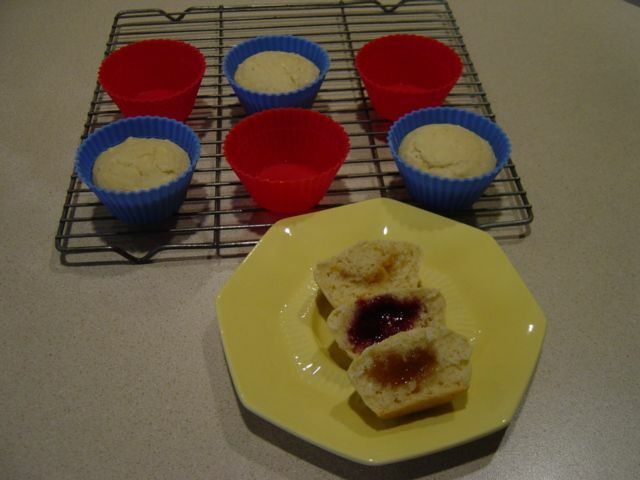 Divide the batter into the muffin cups, about ¼ cup per muffin. Bake the muffins in a 350*F oven for 20 minutes. Turn off the heat and leave them in the oven for 5 more minutes before removing the pan to a cooling rack. 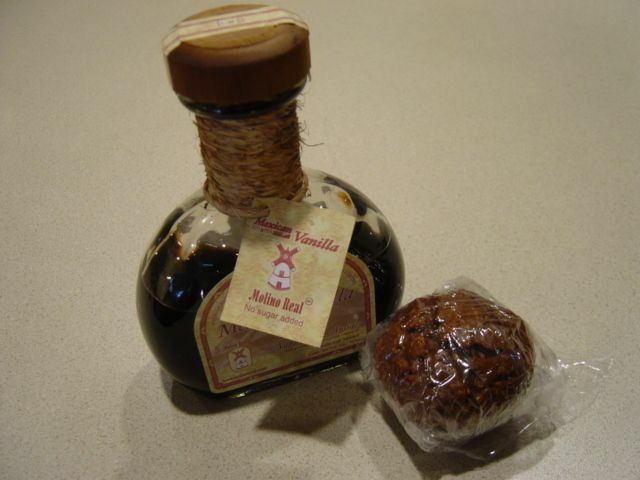 Transfer the muffins to a sealed container when they are just cool to the touch so that they retain their moisture.